If there's one thing you can say to me to make a first-person shooter experience sound more exciting, it's that it's not a modern military shooter. 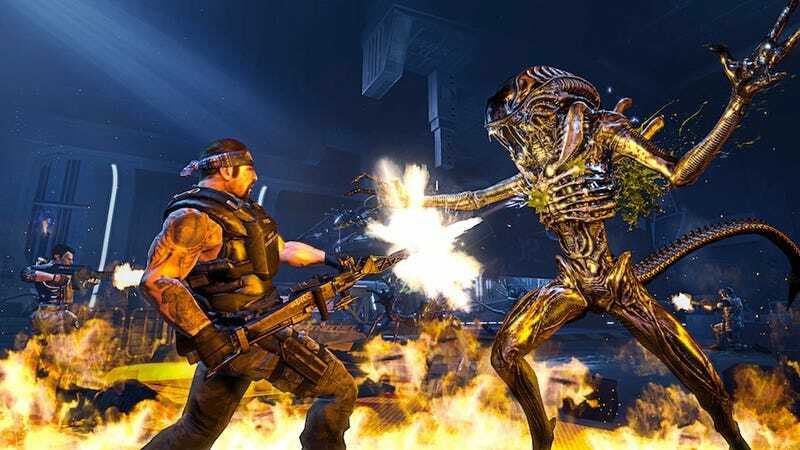 In the case of Aliens: Colonial Marines—releasing this Fall for Xbox 360, PS3, Wii U and PC—that involves having different classes of aliens with acid-burning blood fighting against a group of marines. The multiplayer demo at PAX East this year was predictably short, and we didn't get a chance to play as the aliens. We did, however, get a chance to verse the Gearbox developers in a round of Team Deathmatch. While Gearbox got to play as lunging lurkers and a powerful special class, the Crushers, the humans had a small selection of weapons to choose from. I initially assumed the assault rifle would suit me well, but it turns out most PAX attendees have been ignoring the weapon, as I found myself doing once I discovered the might of the pulse rifle. The pulse rifle is particularly useful because it's alternative shot is a deadly burst of explosive ammunition, and it's what got my kill streaks continuously moving uphill. The shotgun wasn't bad, but for the fast-paced nature of the multiplayer round, I didn't want to be hindered by its requisite pump action and slow reload. But I don't want to tell you about the weapons. What I really want you to know about Aliens: Colonial Marines' competitive multiplayer mode is that it is a high-intensity, high-adrenaline experience. Although I can't speak to the feel of playing on the alien team, playing as one of the humans is edge-of-your-seat fun. I quickly found how uncomfortable being the straggler felt. If I ever found myself at the end of the squad, I'd scramble to quickly enter the middle, knowing how vulnerable that would leave me. Leading the group can be just as agonizingly fun. Every corner you turn is another risk you take, another opportunity for a gangly, greasy-looking creature to leap on to you or an unsuspecting teammate (hopefully the teammate). As if that wasn't enough to get your heart pumping, Gearbox has also included a Motion Sensor to track where nearby teammates or enemies are. As you approach closer and closer to potential death, the tracker beeps more frantically. Needless to say, I didn't use it very often (however useful it may be). I wanted to keep light on my feet, and liberal on the trigger. The aliens have the advantage of a third-person perspective. They also have pheromone-driven sight that highlights players in yellow and special points of interest—like the Smart Gun—in red. The lurkers can pounce on marines and slash at them viciously, a move reminiscent of Left 4 Dead's hunter. The Crusher's speciality is brute force and speed. It also functions as a great distraction while all teammates spray and pray in its direction, allowing lurkers to pounce on them from above or behind. I'm interested to see more of the alien classes, and get my hands on the slimy xenomorphs. Nothing spices up traditional first-person shooter play more than violent, sci-fi creatures.